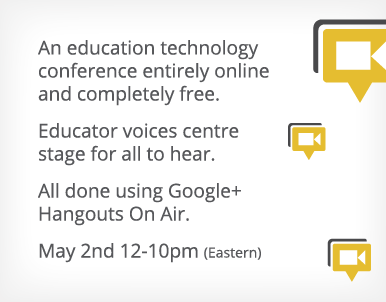 Education on Air is a free online educational technology conference from Google that will be held May 2nd, 2012, from 12-10pm (Eastern). It will be held using Google+ Hangouts on Air. There are some great sessions planned on topics such as paperless classroom, assessment, robotics, digital citizenship, portfolio's, and, of course, using different Google Apps in the classroom. The majority of the presenters are educators, many of whom I know of. Check out the site for the schedule, list of presenters, and how to participate.